A Matter of Memories: :REVIEW: Be Real by Debbie Hodge of Get it Scrapped! 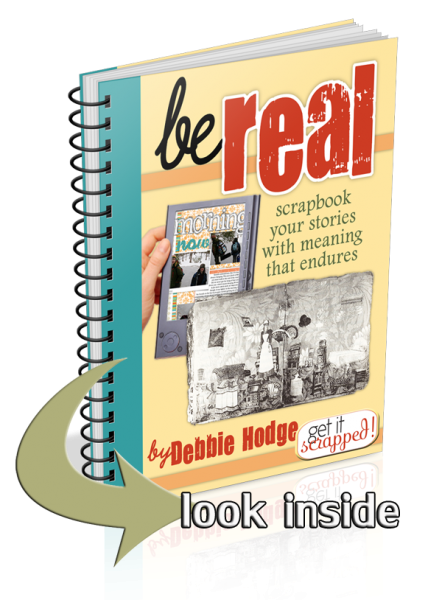 :REVIEW: Be Real by Debbie Hodge of Get it Scrapped! I was so impressed with Hodge's style of instruction in that class. Her writing style is so down-to-earth, yet is was clear that Hodge was quite knowledgeable about her topic. Although I'd already read several books - scrapbooking specific and otherwise - focused on the principles of design, I can honestly say that I learned a great deal from Hodge's class. So, I was quite excited to take Hodge's Be Real self-paced class as well. This time, she focused on another favorite part of scrapbooking - journaling. The goal behind the class is to help you take your everyday life and event photos beyond the obvious as well as to tell stories that really matter and deserve to be preserved. "Each lesson begins with a line from one of Jane Austen’s novels or personal letters–and this is because she is a writer who knew how to make a record of (imagined) life with humor and meaning. Her techniques and observations are a goldmine for memory keepers and memoirists today." The Be Real class includes six lessons in this 70 page PDF document. What I LOVE about Hodge's classes is that she dives into her topic to go beyond the surface and give us very specific examples of how to take her principles to enhance our own scrapbooking. Within each lesson, she offers 4-6 SPECIFIC techniques for how to achieve the principle idea presented. Since the primary focus is journaling, Hodges is careful to include the full text for each layout example provided. Hodge first explains the technique, presents a layout example and then further explains how the various elements of her page - journaling, of course, but also design, photos, titles, etc. - work to reinforce the technique. So, in this way, the instruction within this class go far beyond just journaling techniques. At the end of each lesson, Hodge includes a 'trigger' section that includes a worksheet and/or additional ideas to spark your own ideas of layouts to create based on the journaling technique presented in the lesson. If you're looking at deepening your knowledge and arsenal of techniques in enhancing your storytelling, I would highly encourage that you consider Hodge's Be Real class or one of the other great self-paced options available at Get it Scrapped! Have you take Be Real or any other class at Get it Scrapped!? If so, which ones and what were your thoughts.